Safaga and Soma Bay are 15 km apart on the Egyptian Red Sea. They share many of the same dive sites, including Panorama Reef, the beautiful Middle Reef and the controversial Salem Express. 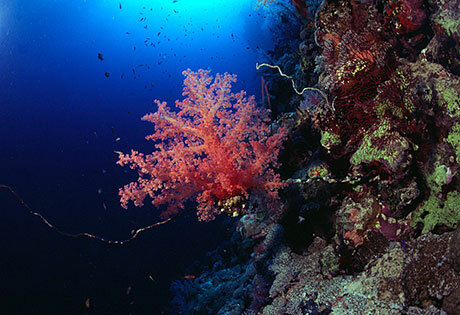 The corals in this area are in excellent condition, remaining healthy even when exposed to higher temperatures. You can dive Safaga and Soma Bay throughout the year. It is quietest in January and February, but the water is cooler then and the weather windy. At the beginning of the year (January to April) You'll need a hood and at least a 5 mm wetsuit (7 mm if you tend to get cold). The dive centres normally accept both Euros and Egyptian Pounds. Take plenty of change for tips for waiters, drivers, etc. These are fine in Egyptian pounds, Euros, GB pounds or US dollars. For both Soma Bay and Safaga you fly into Hurghada airport. When returning, make sure you allow plenty of time to get through the airport as there are many security checks. Don't forget to take insurance which covers diving. The dives are listed roughly from North to South. The best dive sites are probably Middle Reef and Abu Kefan. This dive is done as a boat dive, either on a Zodiac from Soma Bay, on a half-day hard boat trip from Soma Bay or as part of a full day trip from Safaga. It is just 10 minutes from the Soma Bay harbour. Ras means headland and the dive is the northern promontory of Soma Bay. When you descend you might do so into an enormous shoal of young Redtooth Triggerfish with bright blue tails. When fully grown these fish will reach 40 cm long. The reef gives way to a sloping, sandy, bottom dotted with coral clumps. If you see a track in the sand and follow it, it will lead to a venomous buried cone shell. They tunnel into the sand to hide from the Trigger fish who like to eat them. 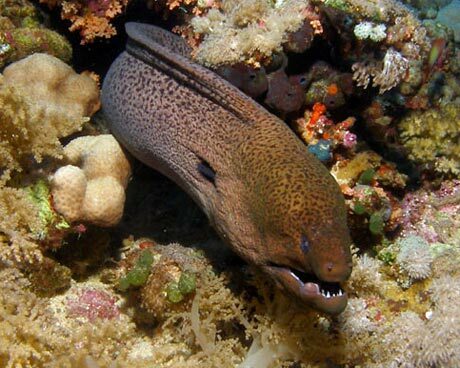 Look for Giant Morays in the reef - sometimes being cleaned by transparent shrimps and juvenile hogfish. These little wrasse have orange heads and white bodies - much prettier than the adults into which they grow. In April and May you can see mating Octopus. A pleasant dive but not a great deal different from the shore dives around the "Breakers" jetty a little further south. An alternative dive is to be dropped at the 40 m drop off further out and drift back towards the reef, if the current is kind. You can also drift all the way back to the Breakers jetty. This is a shore dive made from the jetty of the Breakers Hotel. Some day boats from Safaga also visit. The jetty is a long boardwalk curving over the reef top. Orca Dive Club have little buggies running whenever you wish to transport you and your kit to the end and back again. There is sometimes a current. If so it often runs from North to South. Turning left after jumping in off the jetty brings you over the rope stretching down the reef down to mark the exit, and onto a lovely hard coral garden of Porites and others in shades of blue, green, yellow and brown - dotted with the pink raspberry coral and creamy Acropora. Occasionally a great barracuda hangs entirely motionless over the coral near the surface. Look closely not far from the rope for a dancing Graceful Goby. This lives in partnership with a shrimp. It waves its dotted pectoral fins to stay still over a hole in the sand, whilst the shrimp shifts globules of sand, rolling them out of the hole. When disturbed shrimp and goby shoot back into the hole. This is also a good place for a night dive, when the beautiful feather stars are out. Especially lovely is the 1 m across "Gorgon Head". The name doesn't do it justice. Peer into the raspberry corals to the see the tiny crabs which are unseen during the day. If you are really lucky you might even see a turtle. Again, beautiful corals shallow and close to the jetty. Many reef fish. Several clumps of spiky white coral. Look closely into this to see juvenile lyretail hogfish, tiny anthias and other young fish in their kindergarten. Bigger animals seen here include a torpedo ray and a turtle. The north and south house reefs are similar, but the north is probably the more interesting. A good dive plan is to see which way the current is running (if any) when you get in and swim against the current for the first half of the dive before turning round. Arba'a means four in Arabic. The dive is around and in and out of seven pillars or ergs. They are close together but it is easy to get disorientated. A good place-marker is the split pillar at the eastern side with the cleft inbetween its two halves. In the middle of the group of ergs is a sandy bottom. Here you might see very large stone fish. Look also for the Red Sea Walkman, Inimicus filamentosus. Flashes of the bright inner pectoral fins look red as they use them to "walk along". Quite a shallow dive, the base the of the deepest erg is at 15 m and they reach up to 5 m depth. Very pretty in the shallower water with shoals of Sergeant Major fish cascading down. A half day boat dive from Soma Bay. The largest of the four Tobia dive sites, Tobia Kebir comprises a long reef running north to south, and several ergs to the south of it. There is often a current coming from the north. Boats often moor at the southerly end of the north reef. Divers swim through the channel between the north and south reefs. Porites coral flows down to meet more coral which looks blue-green in colour but when you shine your torch on it is actually lilac. Away from the reefs themselves is a sandy bottom with clumps of coral, like many dive sites in this area. Kebir means large. Tobia is the area, from Tobia island. Animals seen here include a spotted eagle ray and garden eels on entry between the reefs. A good dive. This one is the smallest of the Tobia dive sites (soraya means small in Arabic). 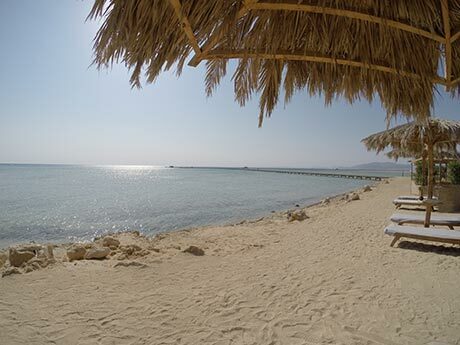 It is a ten minute boat ride away from Soma Bay. Two small reefs running parallel north to south, broken up into ergs. You can dive all round both or go out and back the same way. Look out for Great barracua. The current, if present, normally comes from the north. There is good life on the outer east side of the reef. A very pretty dive. This small reef, 100 m long, has some ergs to the south-east, covered in acropora and other corals with many colourful anthias. A current may be running on the outside of the reef cluster. 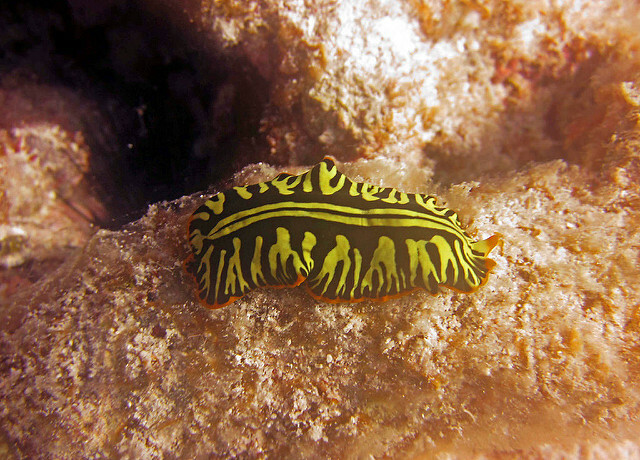 Look out for the tiger flatworm, a striking yellow and brown. It is a good morning dive when the sun is on the east side, although quite shallow at 15 m.
Your boat will probably moor near a patch of seagrass at the southwest of the main reef of Gamul Kebir. Swim through a channel, keeping the reef on your left. Once through the channel it is 15 minutes swim to reach the prettiest part of the dive - two small coral outcrops. The nearer of the two is at 14 m and the further at 15 m. They are both visible from the main reef. These outcrops are very beautiful, full of fish and hard and soft corals. You'll see Anthias, orange-lined cardinal fish, yellowbar angelfish, sergeant major fish, six striped soapfish and many other species. On return look in the seagrass for a seamoth. These have a boxy body and fan-like wings with which they "walk" across the sea bottom. On of the most famous reefs in the area. Liveaboards from Hurghada often stop here for their first dive. Panorama is about an hour's boat journey from Soma Bay. At the south side of Panorama is a plateau at around 30 m deep. At the edge of the plateau is a crevice dropping down, full of Gorgonia. It is a popular dive site and so can be busy. To the north there is sometimes a current which makes it suitable for a drift dive. Look out for a large Napoleon Wrasse (Cheilinus undulatus). These used to be fairly common, and became very tame when many divers took boiled eggs down to feed them. It is thought that this made them all very unhealthy and for years they disappeared. They now seem to be making comeback. You may also see a hawksbill turtle who likes to rest in a crack in the reef. Another unusual sight is a large group of black backed butterflyfish. These are normally solitary or in pairs. 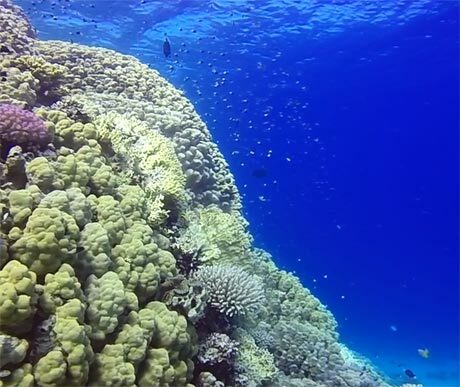 Middle Reef is both beautiful and exhilarating: a wild drift-dive. When diving from the north side to the south east, have a look out over the drop off to start. This is at around 27 m. Keep the reef on your right. To avoid following the reef way out to sea ascend to 12 m where you can then fly over the best coral garden in the area. A good dive with a lovely wall in which are little caves. Very pretty dive with lots of soft corals. Compare liveaboard prices online. Book now & pay later. Well run dive centre with a great house reef. If you have less than 30 dives you need to go with a guide at 10 am or 2 pm. More experienced divers can dive the house reef whenever they like. A converted golf cart runs you up to the end of the jetty. Based at the Breakers Diving and Surfing Lodge, they will drop you back at other local hotels. Run a wide range of PADI and SSI courses. 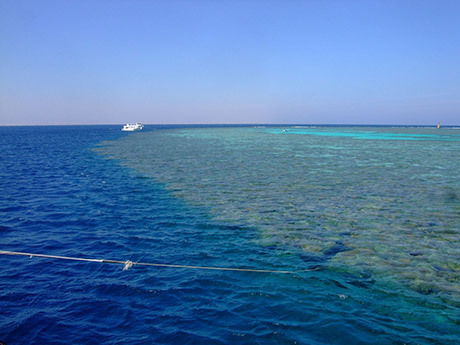 You have a choice of shore diving, half-day boat diving or full day boat diving to places like Panorama and Middle Reef. They accept Euros and Egyptian pounds - under German management. South of the Soma Bay peninsula. 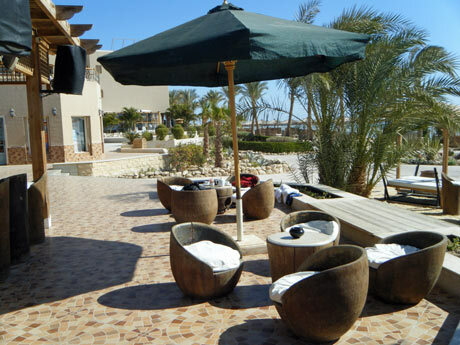 Based at the Sentido Palm Royale Resort on the Hurghada-Safaga highway. North of Safaga, have five boats between 20 and 27 m long. Speak Arabic, Czech, English, French, German, Italian, Polish, Russian and Ukrainian. Located in the heart of Safaga under Egytian-German management. Family-friendly - can organise child care. 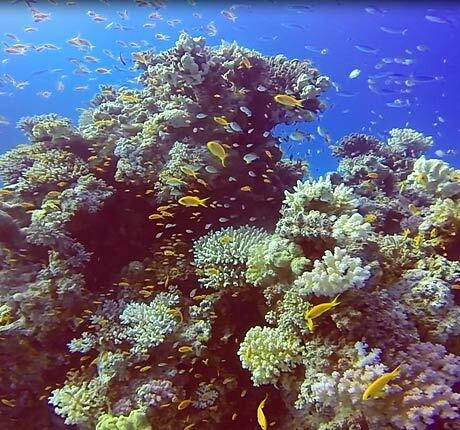 Unlimited shore diving with the opportunity to do boat dives out of Hurghada to places like Middle Reef. Good hotel with pool. Home of Orca Dive Club in Soma Bay. Free wi-fi in all rooms. Yoga, kite surfing, diving, gym. Friendly and informal. Next door to the Breakers Hotel is the Sheraton. This is more formal with a dress code for dinner. Popular with golfers. Has a diving and free diving centre. 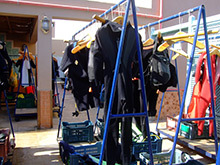 Scuba Schools International (SSI) plus IAC, VDST and CMAS. .
Let us know about your hotel. Fill in this form. Please add your comments. Do you want to recommend a dive operator? Let us know.